Click here to download a pdf of Practice Test 2. Directions: Each of the following questions or incomplete statements below is followed by five suggested answers or completions. Select the one that is best in each case and then mark it on your answer sheet. 1. The graph above shows the velocity vs. time graph for a 3 kg object moving in one dimension. Which of the following is a possible graph of position versus time for this object? 2. A ball is dropped from an 80 m tall building. How long does the ball take to reach the ground? 3. 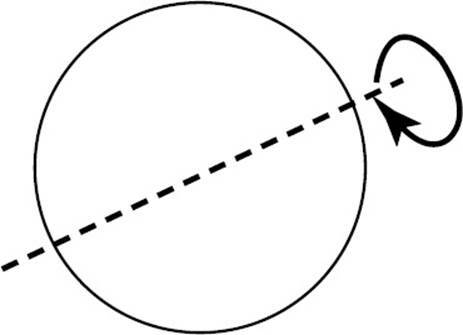 The velocity of an object before a collision is directed straight north and the velocity after the collision is directed straight west, as shown above. 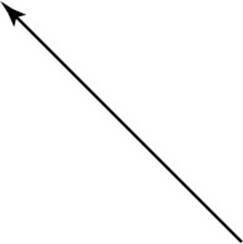 Which of the following vectors represents the change in momentum of the object? 4. 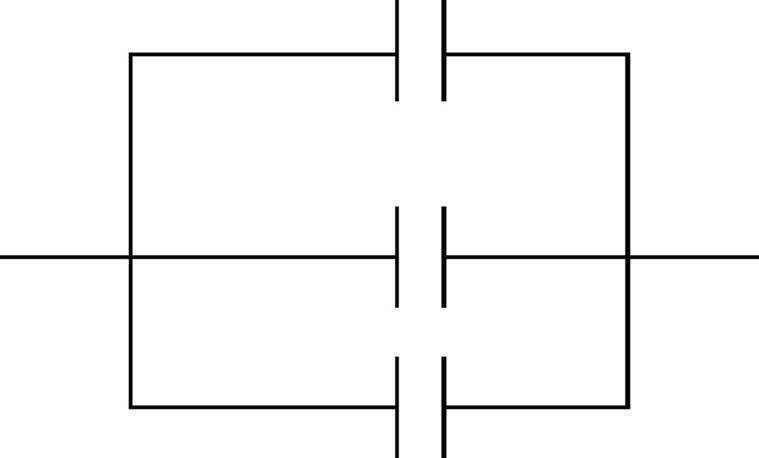 Three blocks of masses 3m, 2m, and m are connected to strings A, B, and C as shown above. The blocks are pulled along a frictionless, horizontal floor with a force, F. Determine the acceleration of the 2m block. 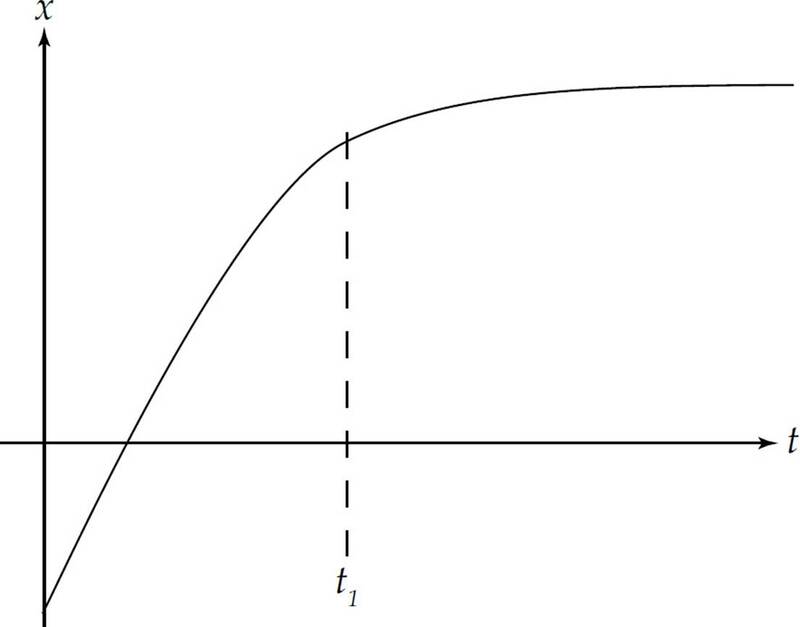 A block of mass 2 kg, initially at rest, is pulled along a frictionless, horizontal surface with a force shown as a function of time by the graph above. 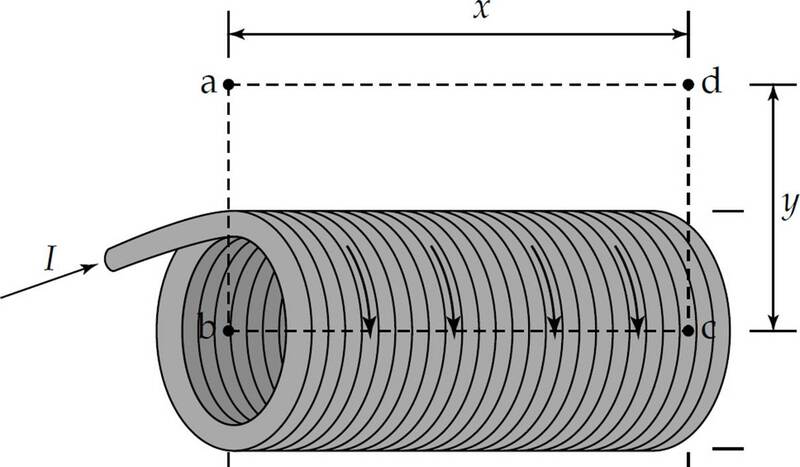 The center of mass of a cylinder of mass m, radius r, and rotational inertia has a velocity of vcm as it rolls without slipping along a horizontal surface. It then encounters a ramp of angle θ, and continues to roll up the ramp without slipping. 7. What is the maximum height the cylinder reaches? 8. Now the cylinder is replaced with a hoop that has the same mass and radius. The hoop’s rotational inertia is mr2. The center of mass of the hoop has the same velocity as the cylinder when it is rolling along the horizontal surface and the hoop also rolls up the ramp without slipping. How would the maximum height of the hoop compare to the maximum height of the cylinder? (A) The hoop would reach a greater maximum height than the cylinder. 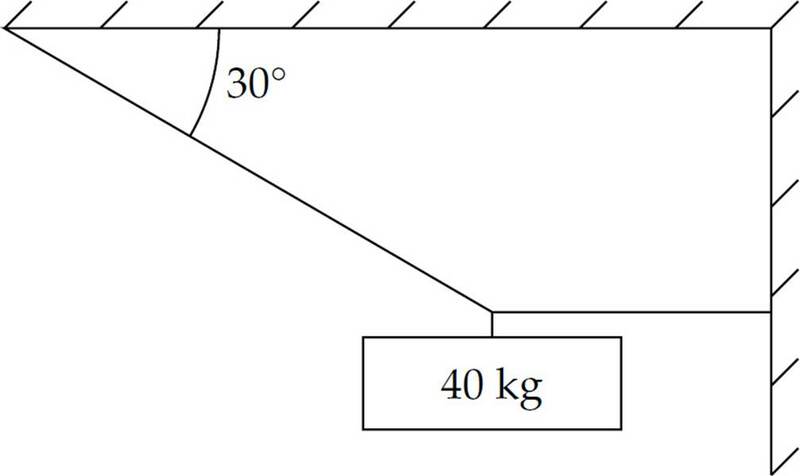 (B) The hoop and cylinder would reach the same maximum height. (C) The cylinder would reach a greater maximum height than the hoop. (D) The cylinder would reach less than half the height of the hoop. 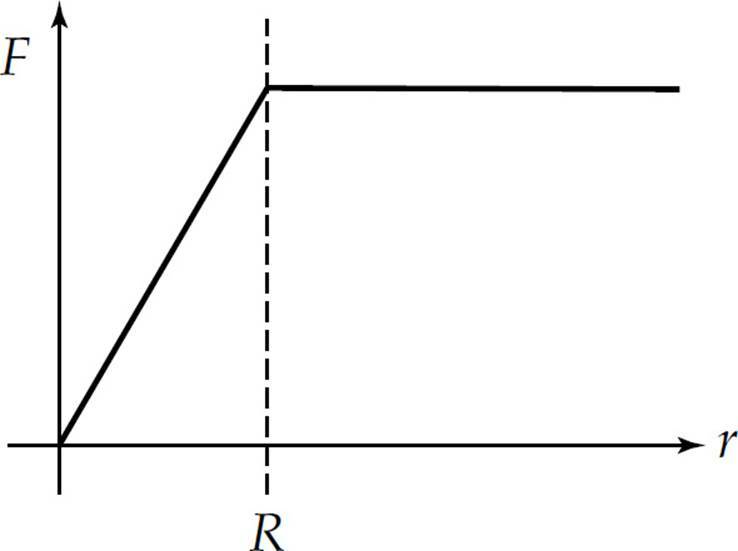 A box is on an incline of angle q above the horizontal. 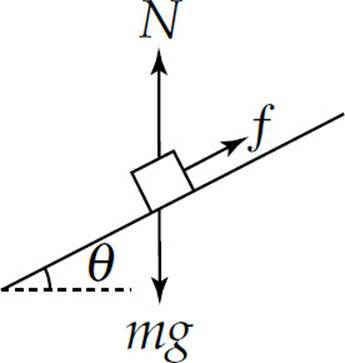 The box may be subject to the following forces: frictional (f), gravitational (Fg), tension from a string connected to it (FT) and normal (N). In the following free-body diagrams for the box, the lengths of the vectors are proportional to the magnitudes of the forces. 10. 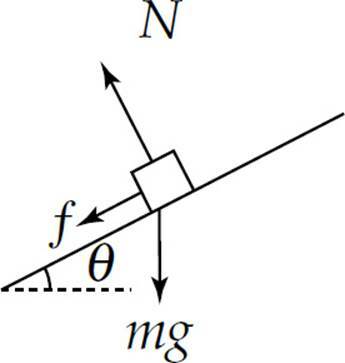 Which of the following best represents the free-body diagram for the box if it is decelerating as it goes up the incline? 11. Which of the following best represents the free-body diagram for the box if it is moving at a constant velocity down the ramp? 12. Which of the following best represents the free-body diagram for the box if its speed is increasing as it moves down the incline? 13. 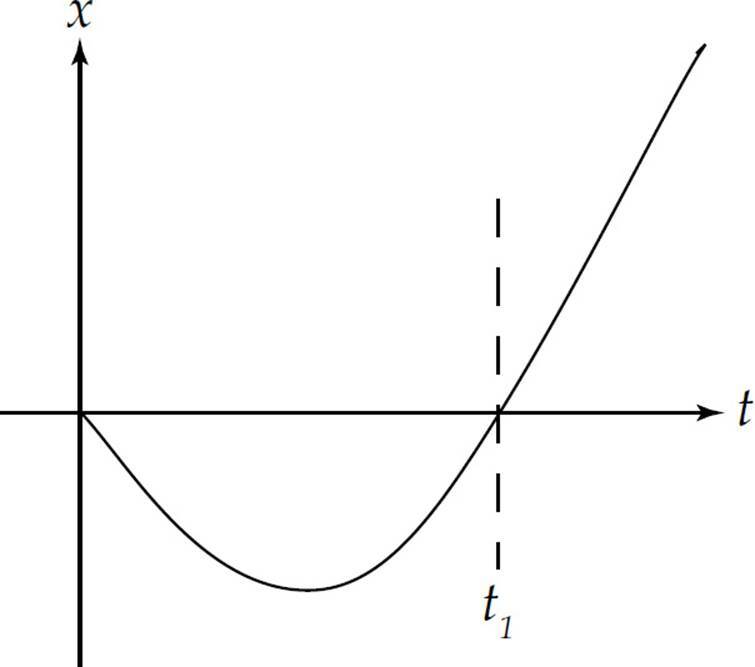 The force on an object as a function of time t is given by the expression F = Ct3, where C is a constant. Determine the change in momentum for the time interval 0 to t1. 14. 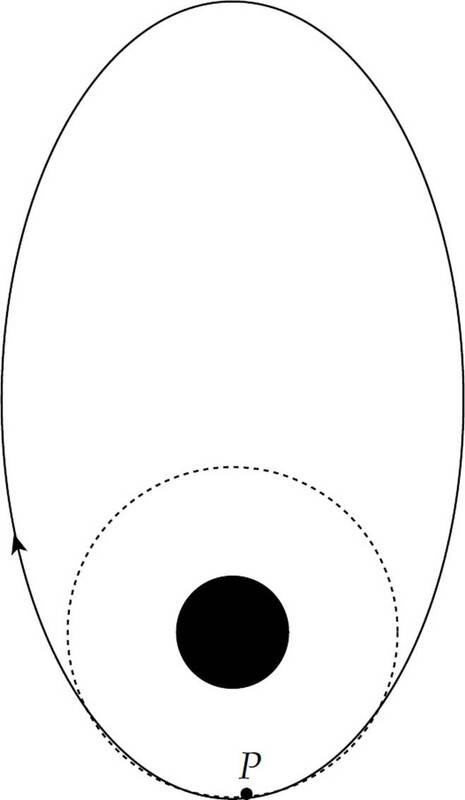 A spaceship orbits Earth in a clockwise, elliptical orbit as shown above. The spaceship needs to change to a circular orbit. When the spaceship passes point P, a short burst of the ship’s engine will change its orbit. What direction should the engine burst be directed? 15. A motorcycle of mass 200 kg completes a vertical, circular loop of radius 5 m, with a constant speed of 10 m/s. How much work is done on the motorcycle by the normal force of the track? 17. A bullet is moving with a velocity v0 when it collides with and becomes embedded in a wooden bar that is hinged at one end, as shown above. Consider the bullet and the wooden bar to be the system. For this scenario, which of the following is true? (A) The linear momentum of the system is conserved because the net force on the system is zero. (B) The angular momentum of the system is conserved because the net torque on the system is zero. (C) The kinetic energy of the system is conserved because it is an inelastic collision. (D) The kinetic energy of the system is conserved because it is an elastic collision. 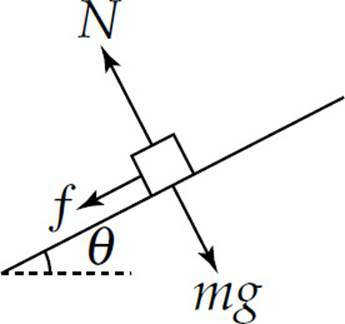 (E) Linear momentum and angular momentum are both conserved. A spring mass system is vibrating along a frictionless, horizontal floor. The spring constant is 8 N/m, the amplitude is 5 cm and the period is 4 seconds. 19. Which of the following equations could represent the position of the mass from equilibrium x as a function of time t, where x is in meters and t is in seconds. 20. Two blocks of masses M and 3M are connected by a light string. The string passes over a frictionless pulley of negligible mass so that the blocks hang vertically. The blocks are then released from rest. What is the acceleration of the mass M? 21. For a particular nonlinear spring, the relationship between the magnitude of the applied force F and the stretch of the spring x is given by the equation F = kx1.5. How much energy is stored in the spring when is it stretched a distance x1? Two ice skaters are moving on frictionless ice and are about to collide. The 50-kg skater is moving directly west at 4 m/s. The 75-kg skater is moving directly north at 2 m/s. After the collision they stick together. 22. 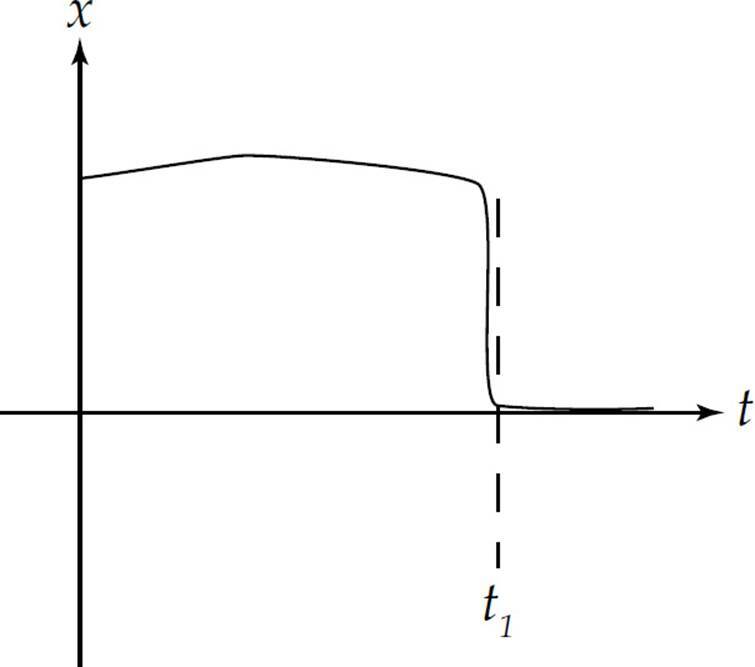 What is the magnitude of the momentum of the two-skater system after the collision? 23. For this scenario, which of the following is true? 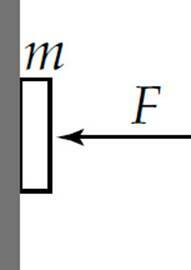 (A) The linear momentum of the system is conserved because the net force on the system is nonzero during the collision. (B) Only the kinetic energy of the system is conserved because it is an inelastic collision. (C) Only the kinetic energy of the system is conserved because it is an elastic collision. (D) The linear momentum of the system is conserved because the net force on the system is zero. (E) Both the linear momentum and the kinetic energy of the system are conserved. 24. The position of an object is given by the equations x = 2.0t3 + 4.0t + 6.25, where x is in meters and t is in seconds. What is the acceleration of the object at t = 1.50 s? 25. Two astronauts are at rest out in space and connected to a rope that is taut, as shown above. Astronaut A throws a heavy oxygen container towards Astronaut B, who then catches the container. Which of the following describes the motion of Astronaut B? 26. Two blocks of masses M and 2M are connected by a light string. The string passes over a pulley, as shown above. The pulley has a radius R and moment of inertia I about its center. 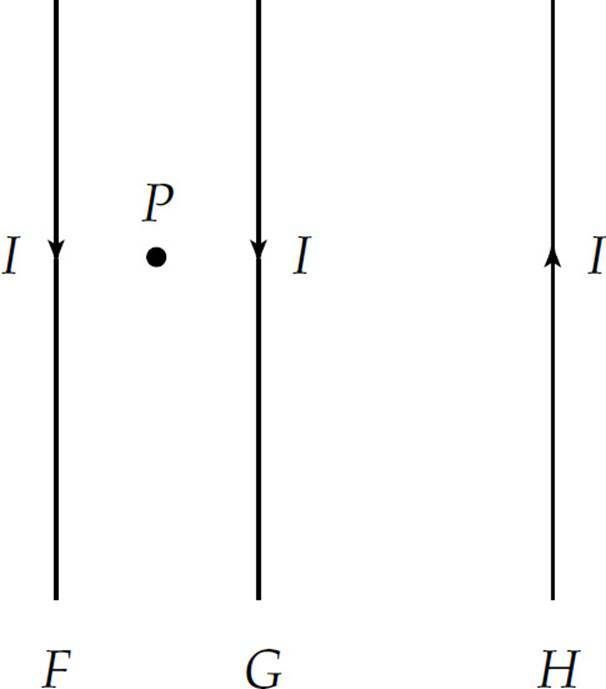 t1 and t2 are the tensions in the string on each side of the pulley and a is the acceleration of the masses. 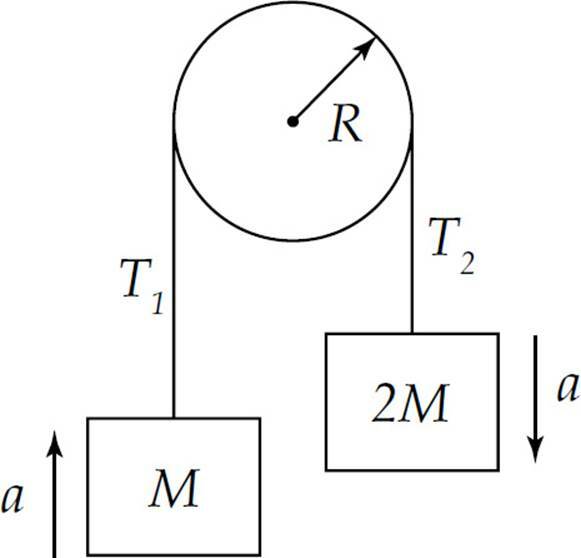 Which of the following equations best describes the pulley’s rotational motion during the time the blocks accelerate? 27. A solid sphere of uniform density with mass M and radius R is located far out in space. A test mass, m, is placed at various locations both within the sphere and outside the sphere. 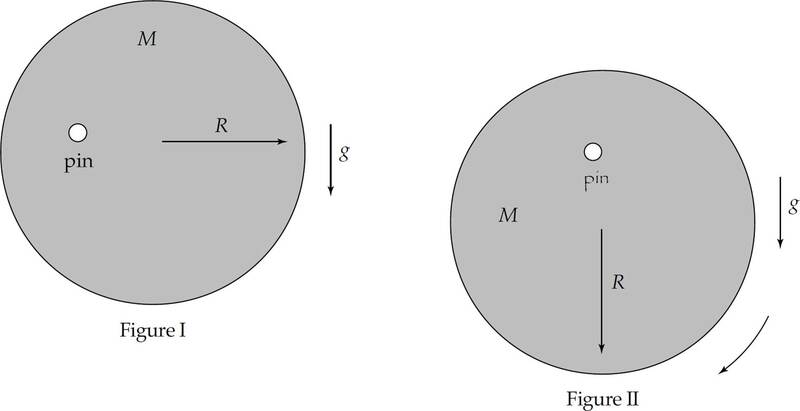 Which graph correctly shows the force of gravity on the test mass vs. the distance from the center of the sphere? 28. 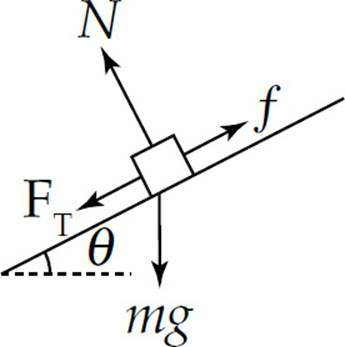 A horizontal force F pushes a book of mass m against a vertical wall, as shown above. How large does the coefficient of friction µ need to be between the wall and the book to prevent the book from slipping down the wall? 32. Physics students are checking the constant acceleration equations of kinematics by measuring the velocity of a tennis ball that is dropped and falls 6 meters and then passes through a photogate. The predicted velocity is 20% above the velocity measured by the photogate. Which of the following best describes the cause of the large percent difference? (A) The ball changes its shape while falling. (B) The acceleration of gravity varies as the ball is falling. (C) Air resistance increases the acceleration of the ball. (D) The acceleration of the balls varies with the velocity. (E) The acceleration of gravity changes due to air resistance. 33. An object is launched and follows the dashed path shown above. If air resistance is considered, when is the velocity of the object the greatest and the acceleration of the object the greatest? 34. 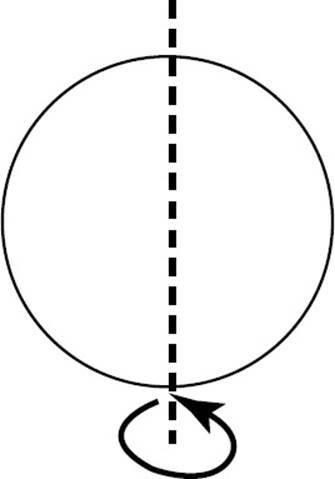 A disk is rolling without slipping along the ground and the center of mass is traveling at a constant velocity, as shown above. 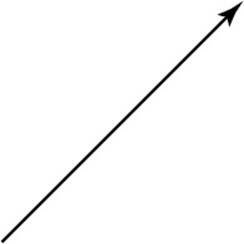 What direction is the acceleration of the contact point P, and the center of mass? 35. The escape velocity for a rocket launched from the surface of a planet is v0. Determine the escape velocity for another planet that has twice the mass and twice the radius of this planet. 1. A massless spring with force constant k is attached at its left end to a wall, as shown above. Initially, block A and block B, each of mass M, are at rest on a frictionless, level surface, with block A in contact with the spring (but not compressing it) and block B a distance x from block A. Block A is then moved to the left, compressing the spring a distance of d, and held in place while block B remains at rest. First block A is released, then as it passes the equilibrium position loses contact with the spring. After block A is released it moves forward and has a perfectly inelastic collision with block B and then follows the frictionless, curved path shown above. The radius of the valley and the hill in the diagram are both R. Answer the following in terms of M, k, d, x, g and R.
(a) Determine the speed of block A just before it collides with block B. (b) Determine the speed of block B just after the collision occurs. 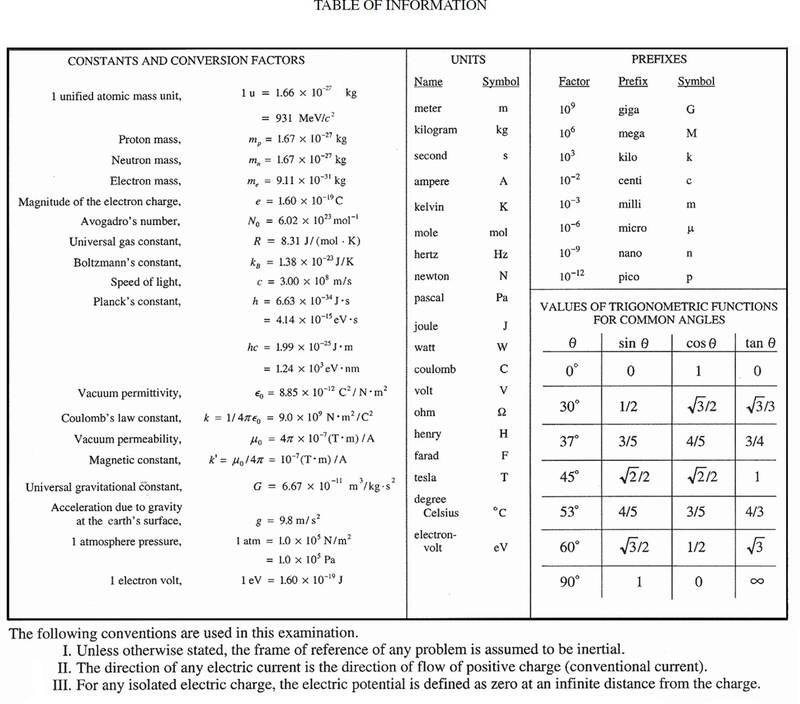 (c) Determine the change in kinetic energy for the collision. (d) Determine the normal force on the boxes when they are at position P, the top of the hill. 2. Physics students are performing a lab using the mass-pulley system shown above. The cart has a force sensor attached to it, and the total mass of the force sensor and cart is 1.2 kg. The force sensor is attached to a 300-gram hanging mass by a string that is placed over a pulley. When the system is released, a motion detector recording the motion of the cart produces the following velocity vs. time graph. (a) Calculate the acceleration of the cart. 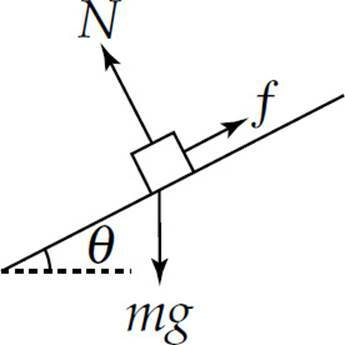 (b) Assume tension is the only horizontal force on the force sensor/cart combination (ignore friction). Calculate the tension in the string for this scenario. (c) The measured tension is actually 20% greater than the tension predicted in (b). Explain why this might be the case. The force sensor and the motion sensor are working properly, so do not use faulty data to explain the result. (d) Describe a process you could use to determine the rotational inertia of the pulley with this system, a meterstick, the force sensor, and motion sensor. 3. 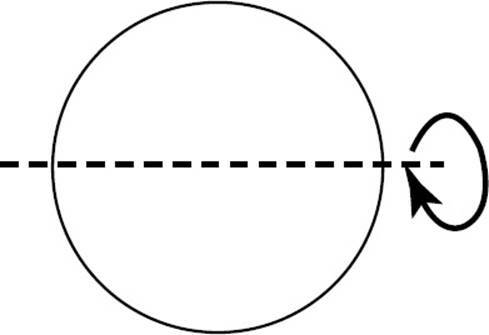 A disk of mass M and radius R is pinned half of the way along its radius, and held in a horizontal position, as shown in Figure I. 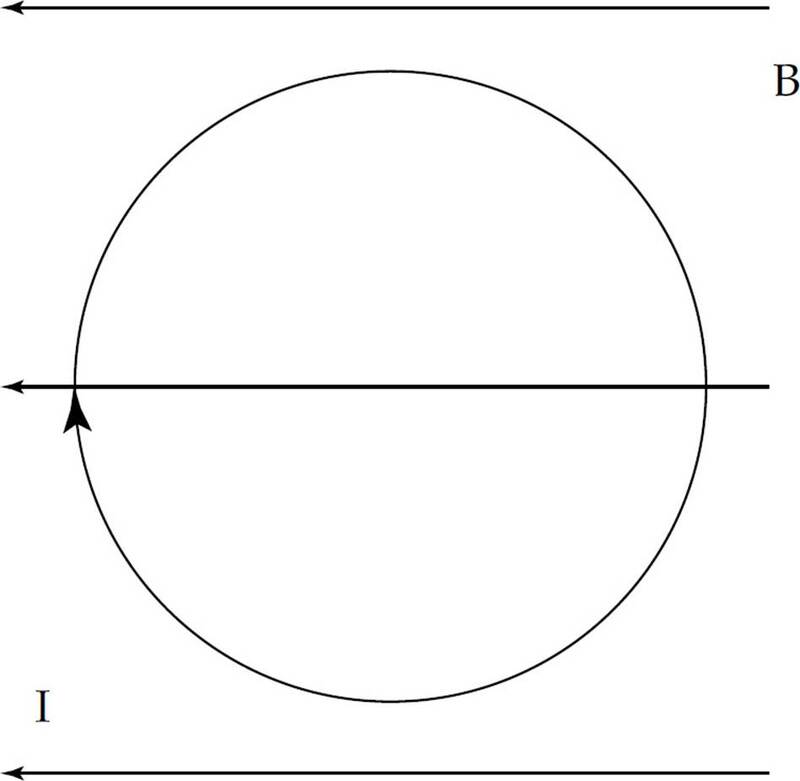 The rotational inertia of the disk about its center is . The disk is released at t = 0 s, and falls to the vertical position shown in Figure II, and continues to rotate about the pin. Answer the following in terms of M, R, and g.
(a) Calculate the rotational inertia of the disk about the pin. (b) Calculate the angular acceleration of the disk at t = 0 s.
(c) Calculate angular velocity of the disk when it is in the vertical position shown in Figure II. Now the disk is stopped and brought to rest in the vertical position shown in Figure II. It is given a slight disturbance to an angle θ0. (d) Calculate the angular frequency of the oscillation. 36. Three 3 mF capacitors are connected in parallel as shown above. 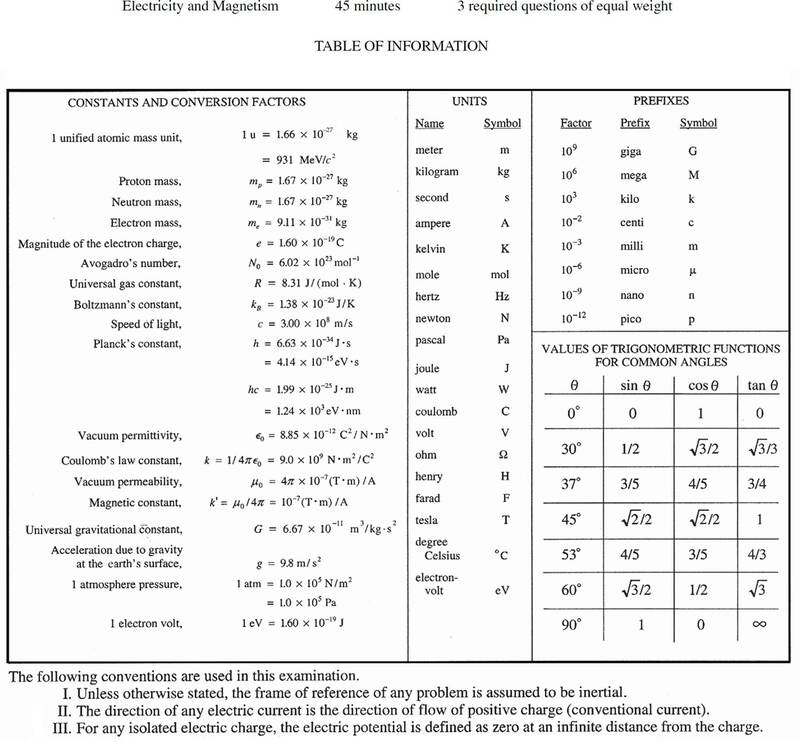 Determine the equivalent capacitance of the arrangement. 37. A microwave oven is connected to an outlet, 120 V, and draws a current of 2 amps. At what rate is energy being used by the microwave oven? 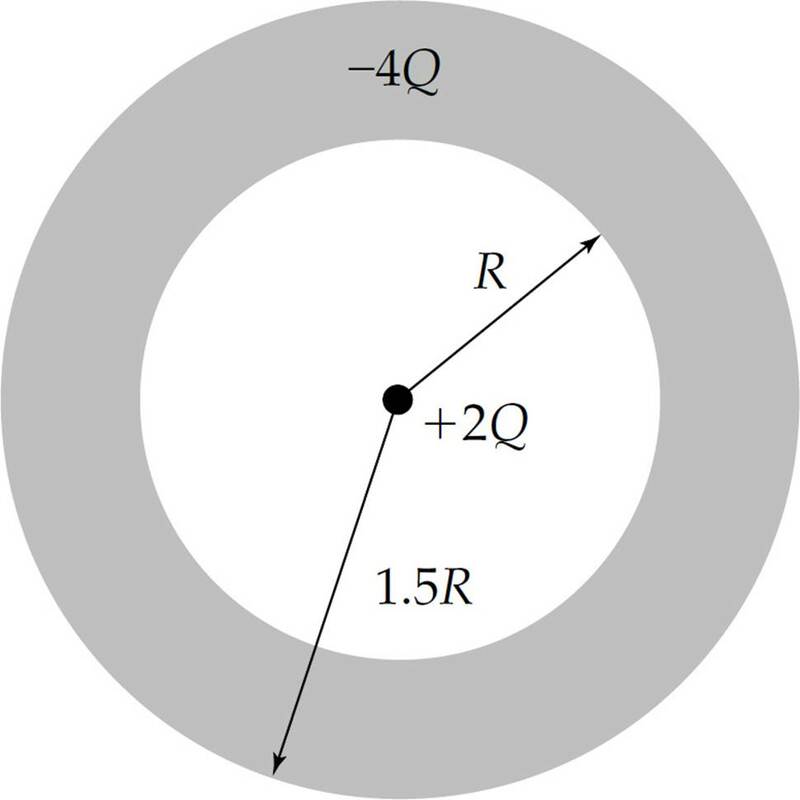 A particle of charge –q and mass m moves with speed v perpendicular to a uniform magnetic field B directed out of the page. 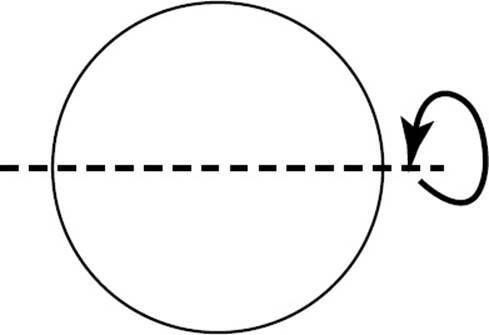 The path of the particle is a circle of radius r, as shown above. 40. 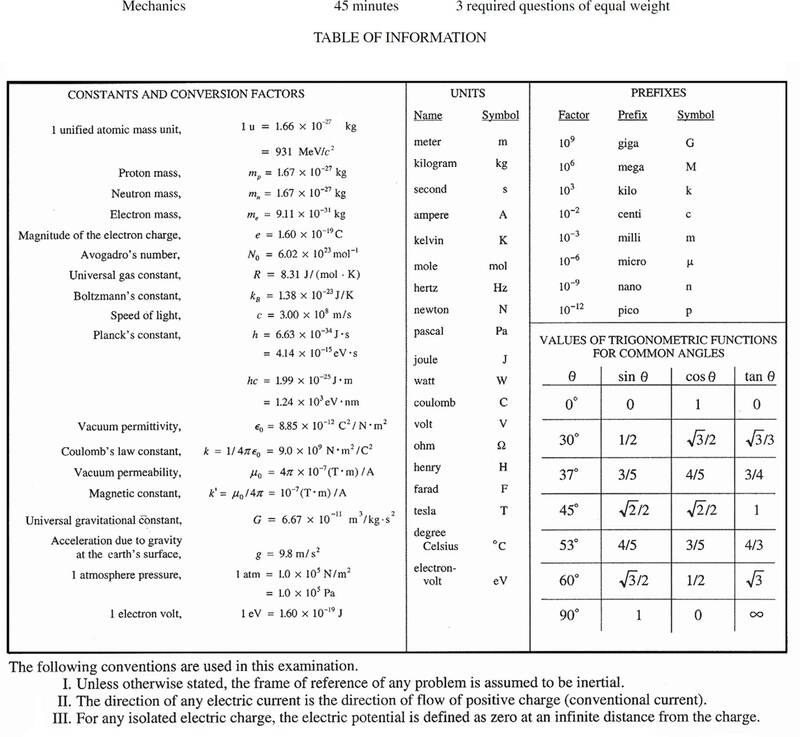 Which of the following correctly gives the direction of motion and the magnitude of the acceleration of the charge? 44. An ideal solenoid with N total turns has a current I passing through the helical wires that make up the solenoid. Ampere’s Law is used with a rectangular path abcd as shown above, to calculate the magnitude of the magnetic field B within the solenoid. 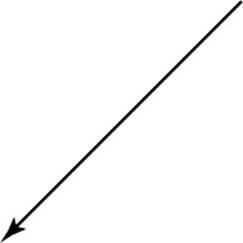 The horizontal distances of the path are length x and the vertical distances of the path are length y. Which of the following equations results from the correct application of Ampere’s law in this situation? Particles of charge +3Q and +Q are located on the y-axis as shown above. Assume the particles are isolated from other particles and are stationary. 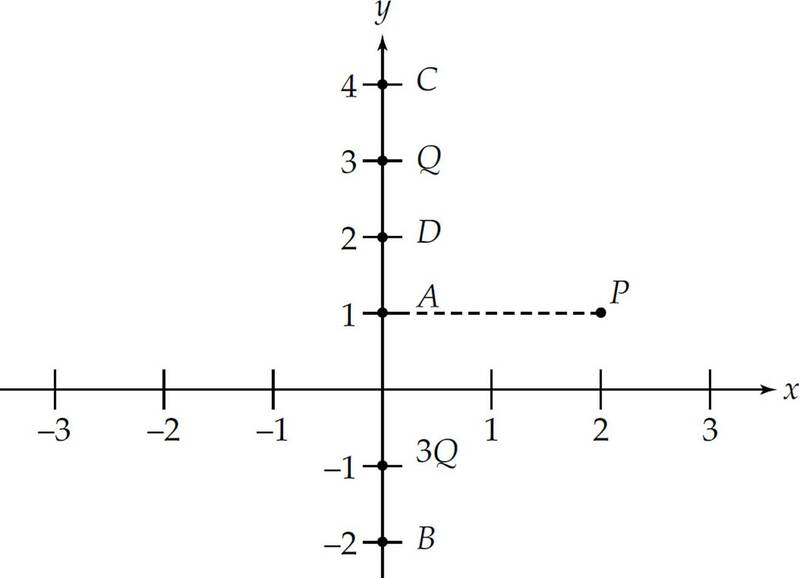 A, B, C, D, and P are points in the plane as indicated in the diagram. 45. 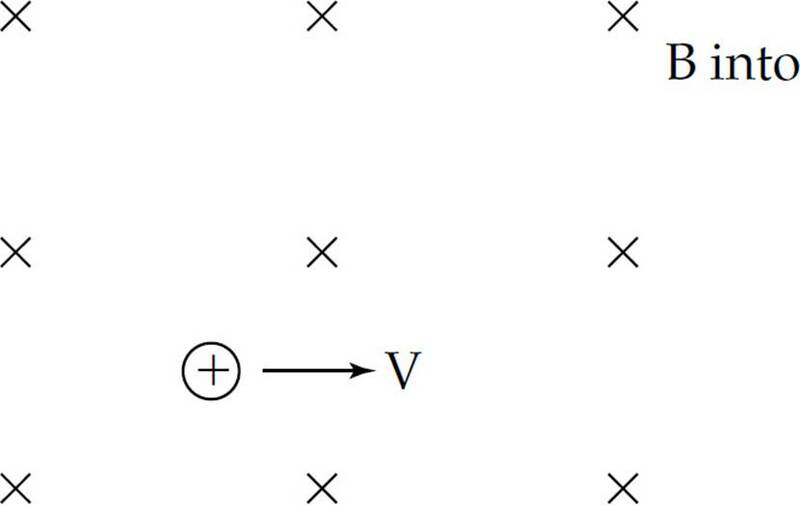 Which of the following describes the direction of the electric field at point P? 46. 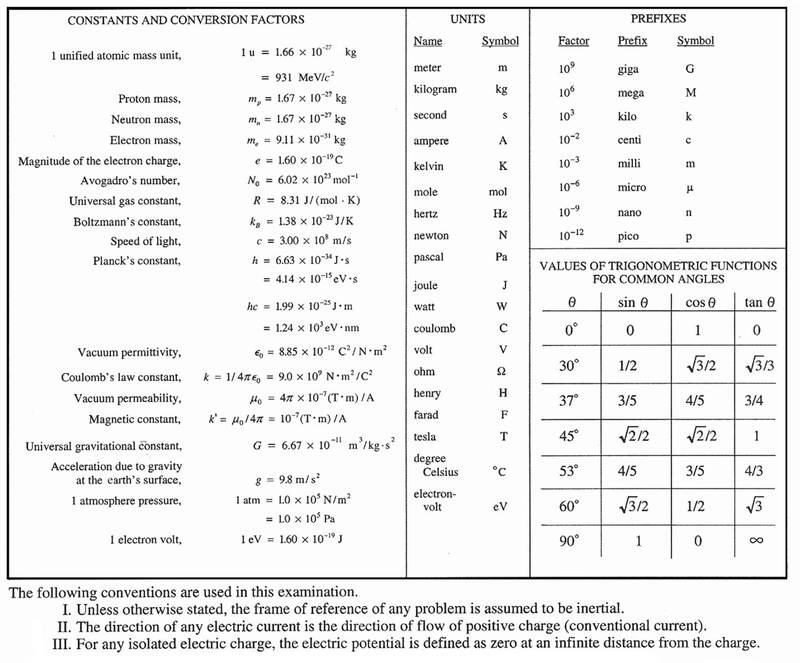 At which of the labeled points is the electric potential zero? 48. Two conducting cylindrical wires are made out of the same material. Wire X has twice the length and half the radius as wire Y. What is the ratio of their resistances? 49. 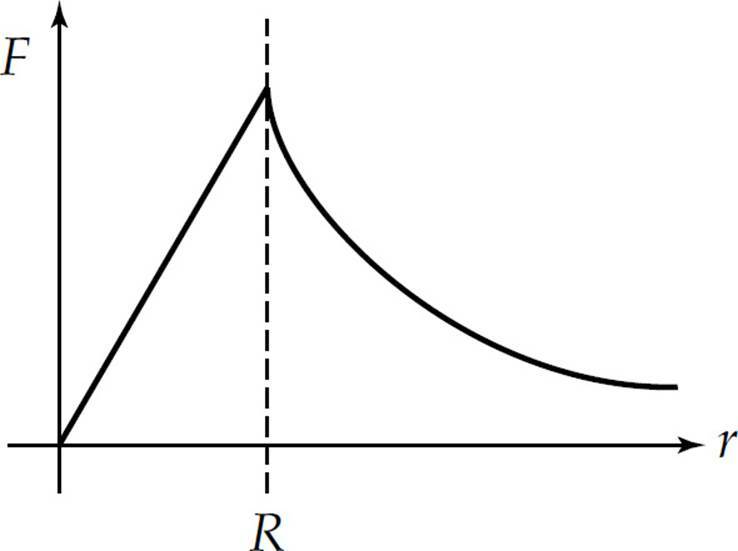 A graph of electric potential V as a function of the radius from the origin r is shown above. What can be concluded about the electric field in the region 0 < r < R? 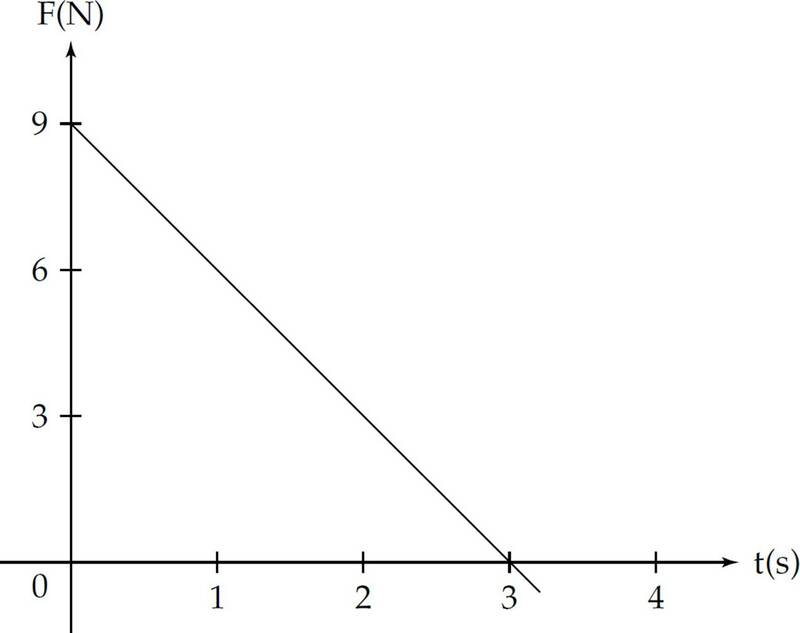 (A) It increases linearly as r increases. 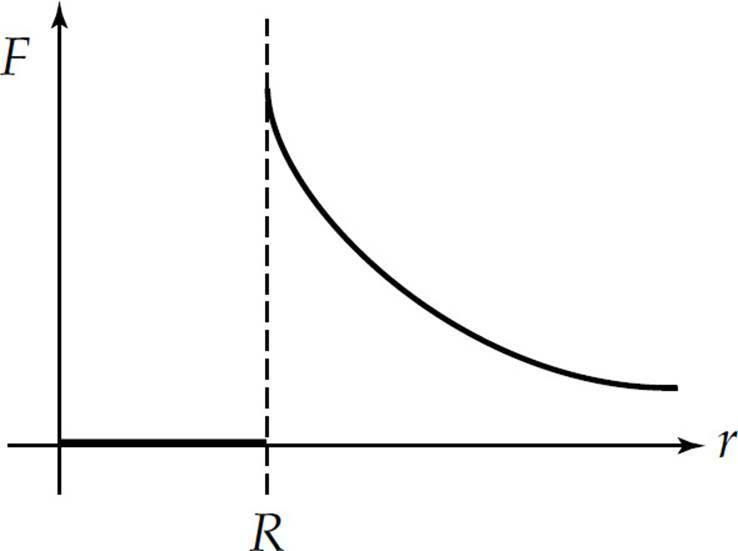 (B) It decreases linearly as r increases. 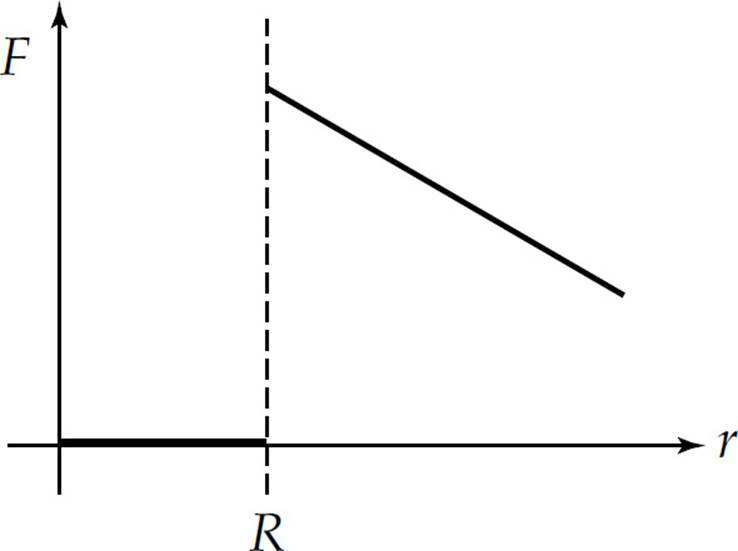 (D) It increases non-linearly as r increases. 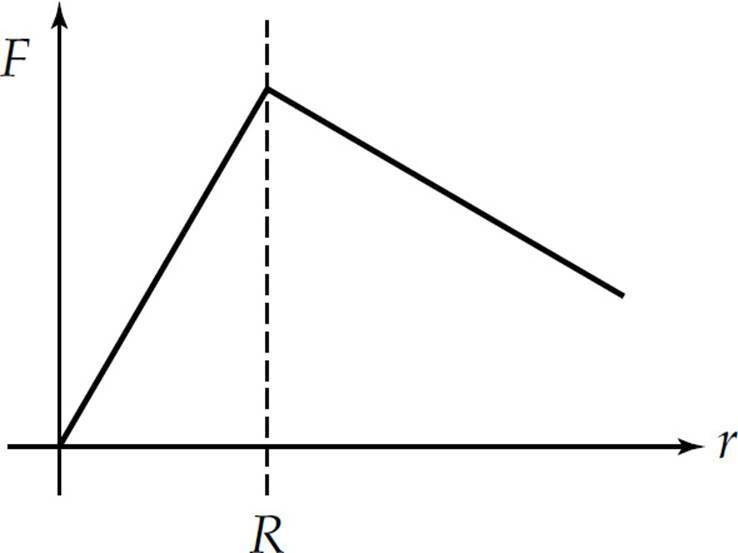 (E) It decreases non-linearly as r increases. 51. A square conducting loop of wire lies so that the plane of the loop is perpendicular to a constant magnetic field of strength B. Suppose the length of each side of the loop ℓ could be increased with time t so that ℓ = kt2, where k is a positive constant. What is the magnitude of the emf induced in the loop as a function of time? 52. A battery with emf ε and internal resistance of 30 Ω is being recharged by connecting it to an outlet with a potential difference of 120 V as shown above. While it is being recharged, 3 A flows through the battery. Determine the emf of the battery. 53. A positively charged particle is moving with a constant velocity through a region with both a magnetic field and electric field. The magnetic field and the motion of the particle are shown above. What direction must the electric field be to cause the particle to travel at a constant velocity? 54. 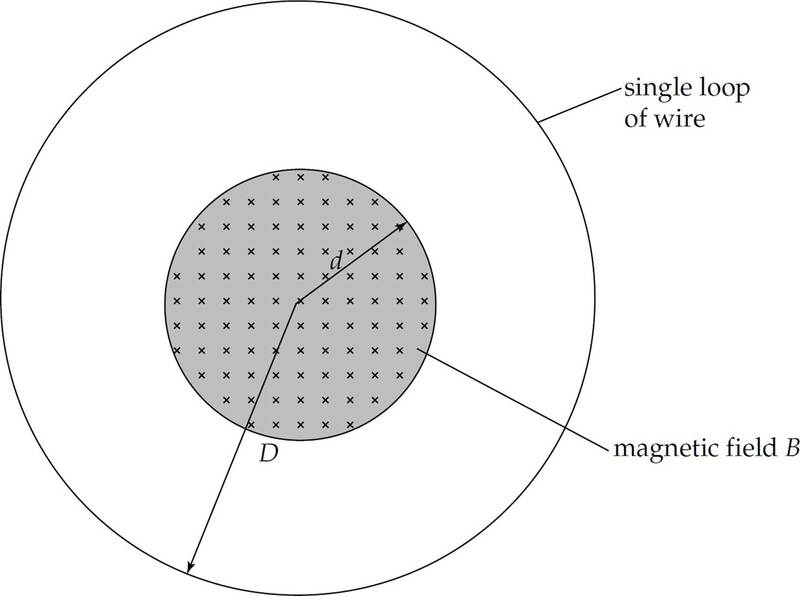 A conducting loop of wire is initially around a magnet as shown above. The magnet is moved to the left. What is the direction of the force on the loop and the direction of the magnetic field at the center of the loop due to the induced current? 55. A loop of wire carrying a current I is initially in the plane of the page and is located in a uniform magnetic field B which points toward the left side of the page, as shown above. Which of the following shows the correct initial rotation of the loop due to the force exerted by the magnetic field? 56. 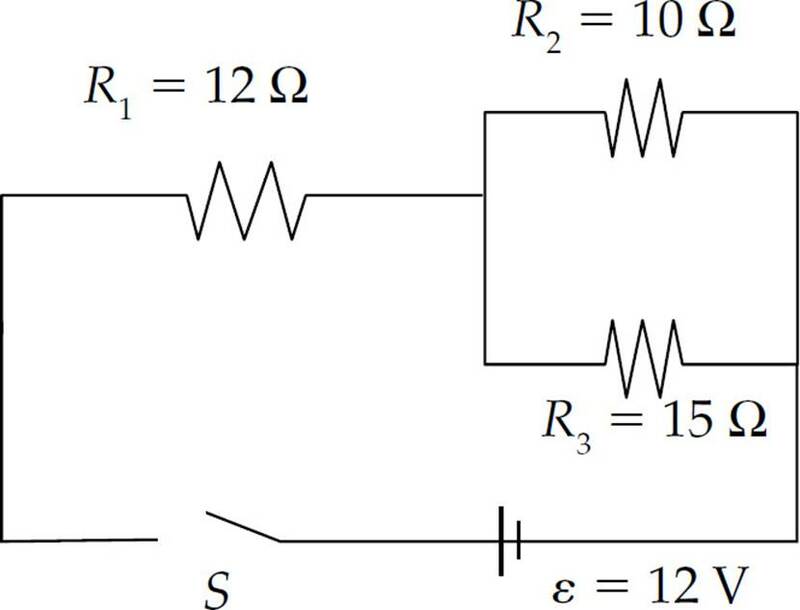 What is the equivalent resistance of the three resistors shown in the circuit above? 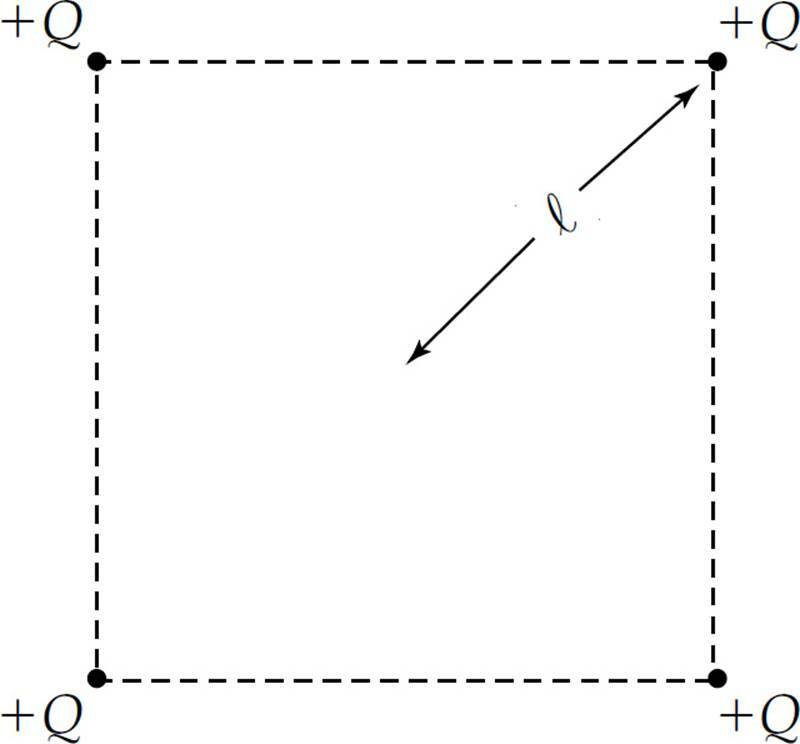 Four particles, each with a charge +Q, are held fixed at the corners of a square, as shown above. The distance from each charge to the center of the square is ℓ. 57. What is the magnitude of the electric field at the center of the square? 58. What is the magnitude of the work required to move a charge of +3Q from the center of the square to very far away? The diagram above shows equipotential lines produced by a charge distribution. A, B, C, D, and E are points in the plane. 59. At which point is the magnitude of the electric field the greatest? 60. 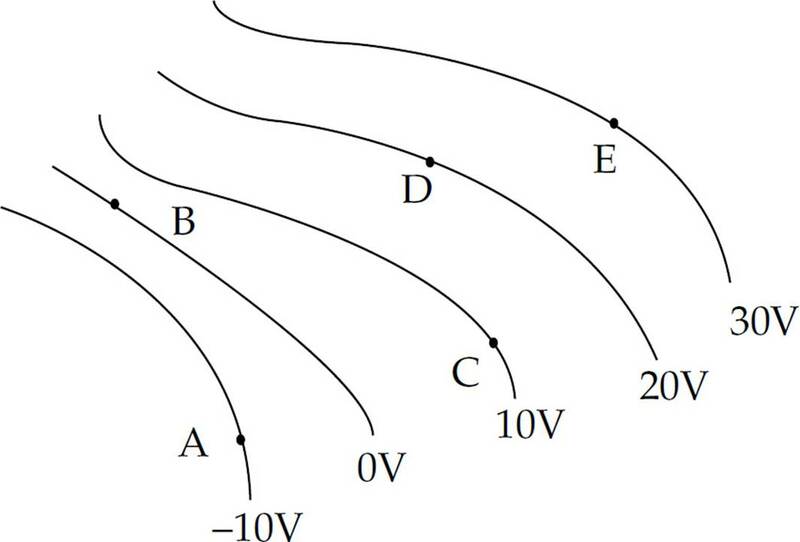 Which vector below bests describes the direction of the electric field at point D ? 61. 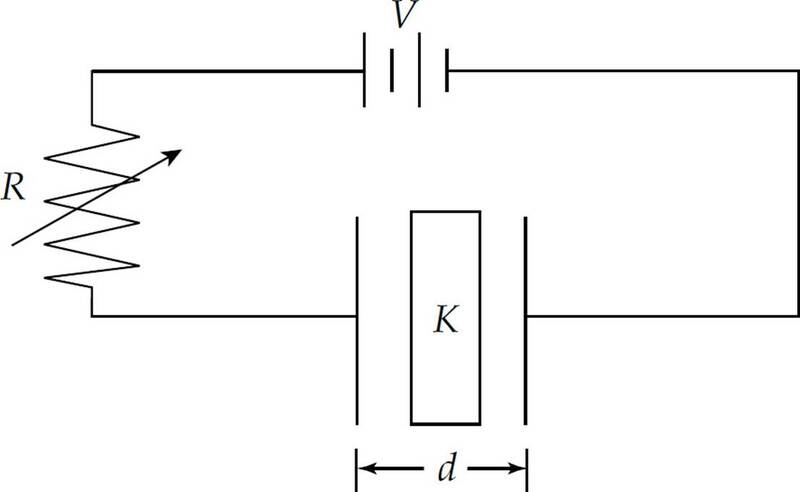 A particle with a –3 µC charge is released from rest on the –10 V equipotential line. What is the particle’s change in electric potential energy when it reaches the 20 V equipotential line? 62. 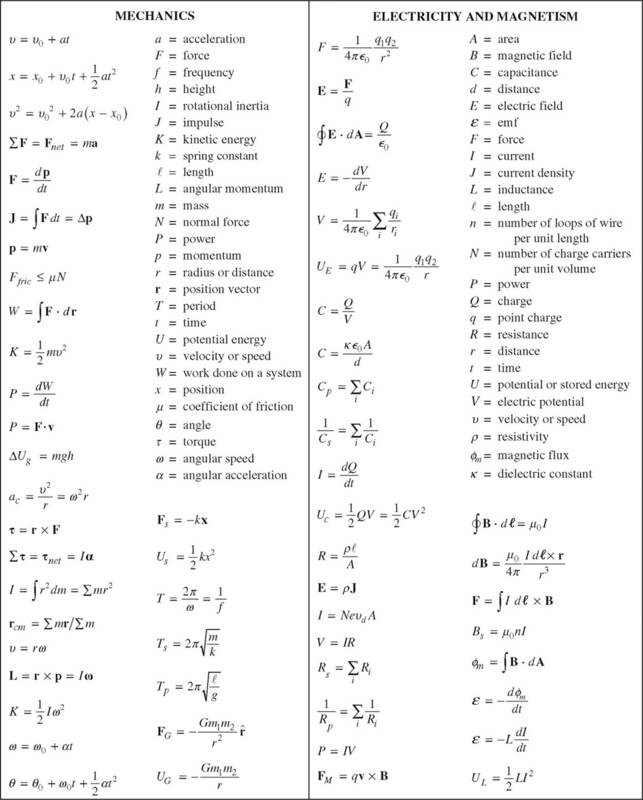 Which of Maxwell’s equations allows for the calculation of a magnetic field due to a changing electric field? 63. A parallel plate capacitor has a dielectric material between the plates with a constant K. The capacitor is connected to a variable resistor R and a power supply of potential difference V. Each plate of the capacitor has a cross-sectional area A and the plates are separated by a distance d. Which of the following changes could increase the capacitance and decrease the amount of charge stored on the capacitor? 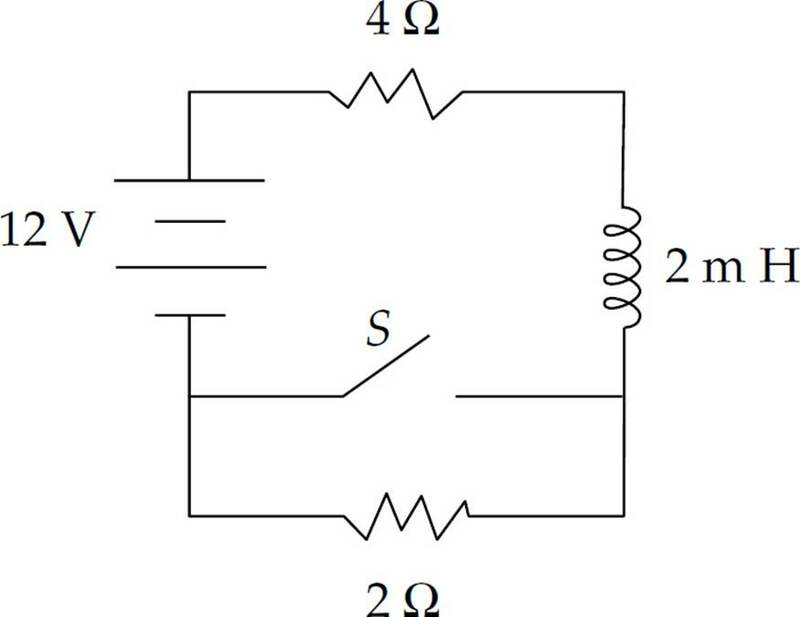 Questions 66–67 relate to the circuit represented below. The switch S, after being open a long time, is then closed. 66. What is the potential difference across the inductor immediately after the switch is closed? 67. What is the current through the 4 Ω resistor after the switch has been closed a long time? 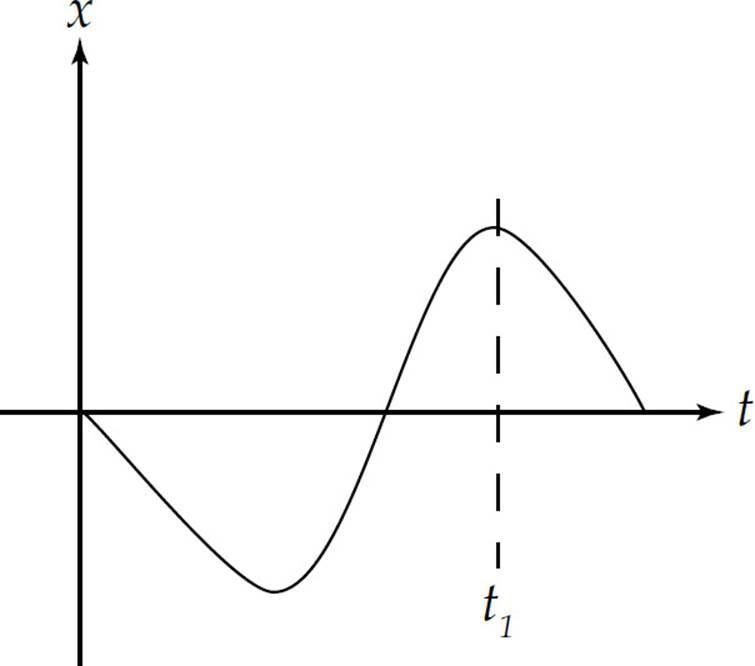 ρ = ar, where ρ is the volume charge density and a is a positive constant. 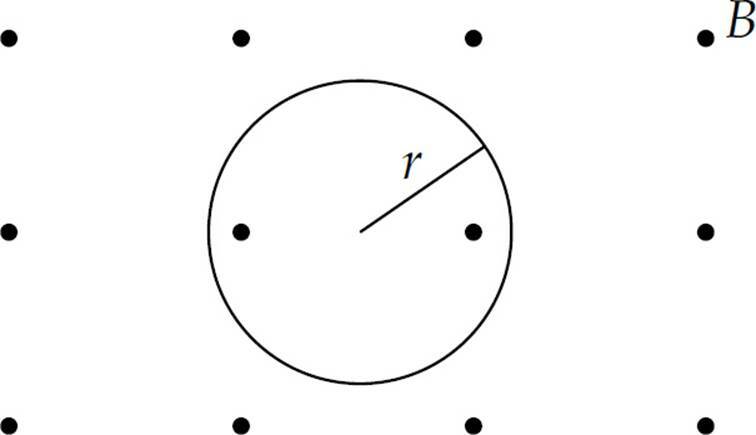 The distribution goes out to a radius R.
Which of the following is true of the electric field strength due to this charge distribution at a distance r from the center? (A) It increases as r approaches infinity. (B) It decreases linearly for r > R.
(C) It increases linearly for r > R.
(D) It increases linearly for r < R.
(E) It increases non-linearly for r < R.
70. 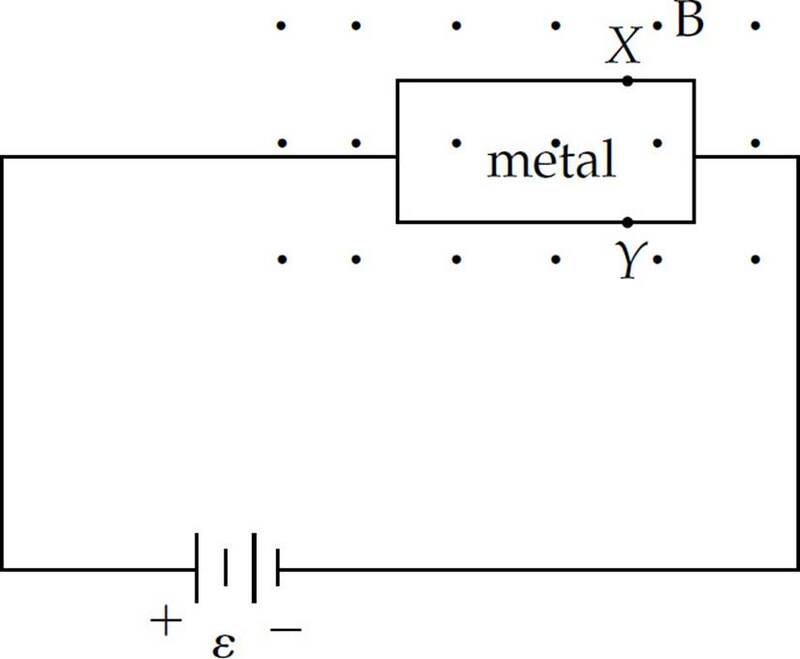 A piece of metal in the plane of the page is connected in a circuit as shown above, causing electrons to move through the metal to the left. The piece of metal is in a magnetic field B directed out of the page. X and Y are points on the edge of the metal. Which of the following statements is true? 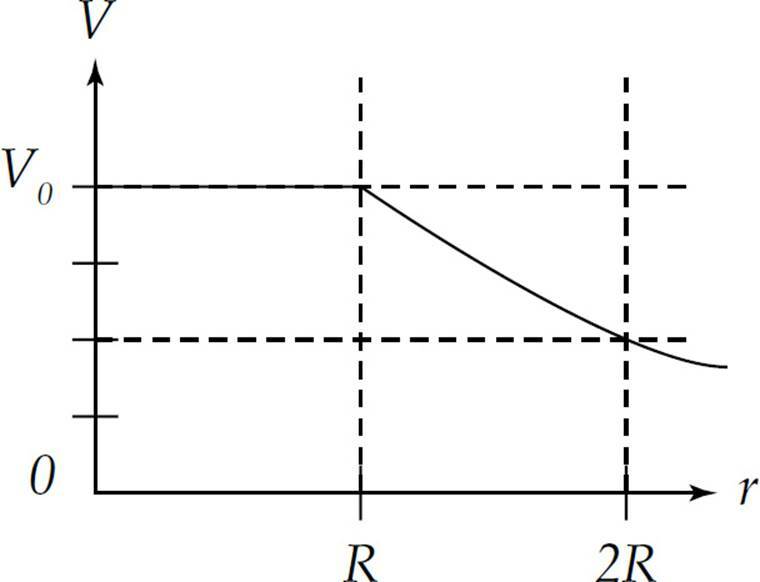 (A) The current will decrease to zero due to the magnetic field. (B) The potentials at X and Y are equal. (C) X is at a higher potential than Y. (D) Y is at a higher potential than X. 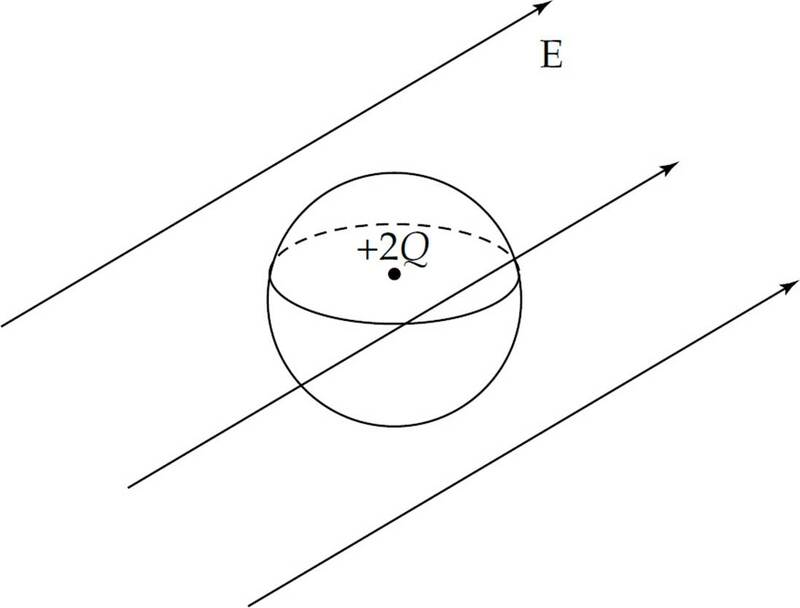 (E) The current will increase exponentially due to the magnetic field. 1. 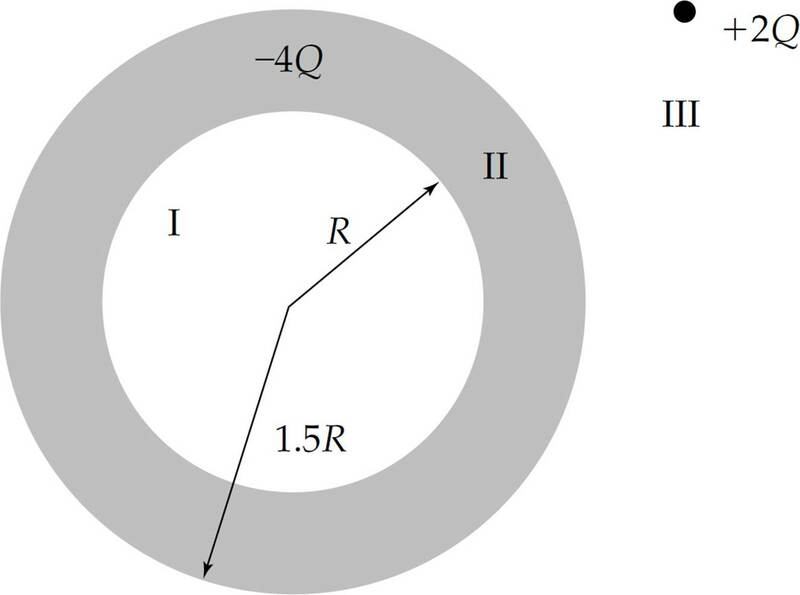 A spherical, metal shell of inner radius R and outer radius 1.5R has a charge of –4Q. A point charge of +2Q is initially located outside the shell as shown above. Express all answers in terms of fundamental constants and given values. (a) (i) Determine the charge on each surface of the spherical shell. (ii) Sketch the electric field in regions I, II and III. 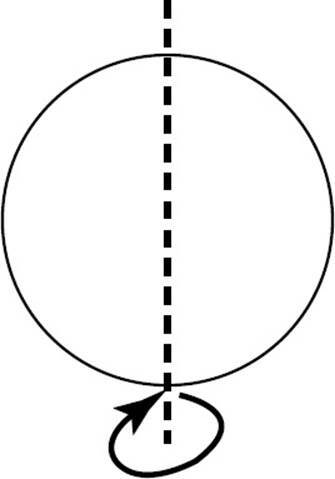 Now the +2Q point charge is moved to the center of the spherical shell as shown above. (b) Determine the electric field strength for the following radii. 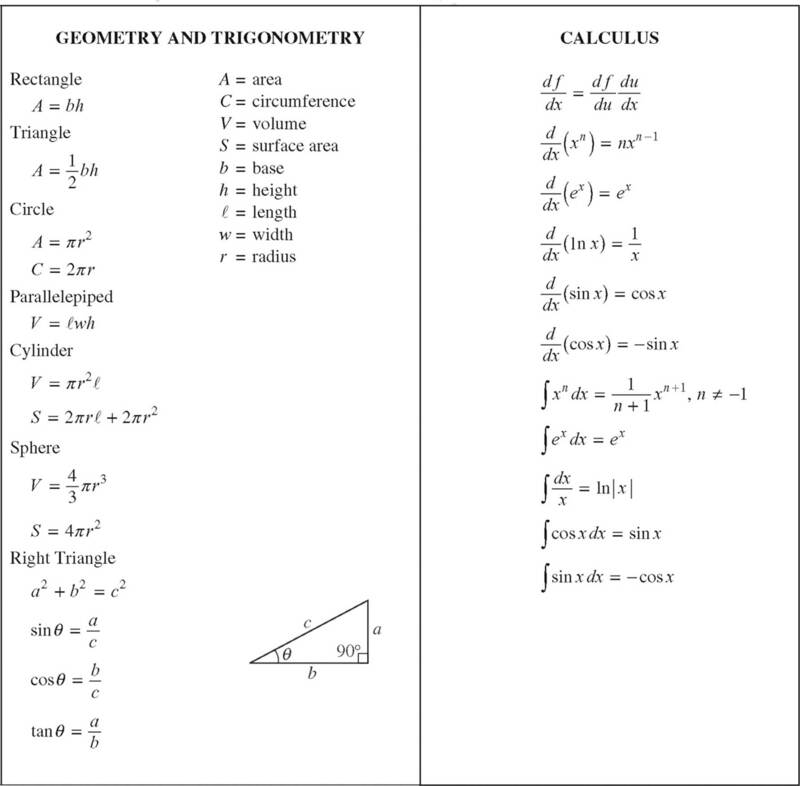 (c) Determine the potential difference between infinity and the outside surface of the spherical shell. 2. In the circuit shown above, the switch S is initially in the open position and both capacitors are initially uncharged. Then the switch is moved to position A. 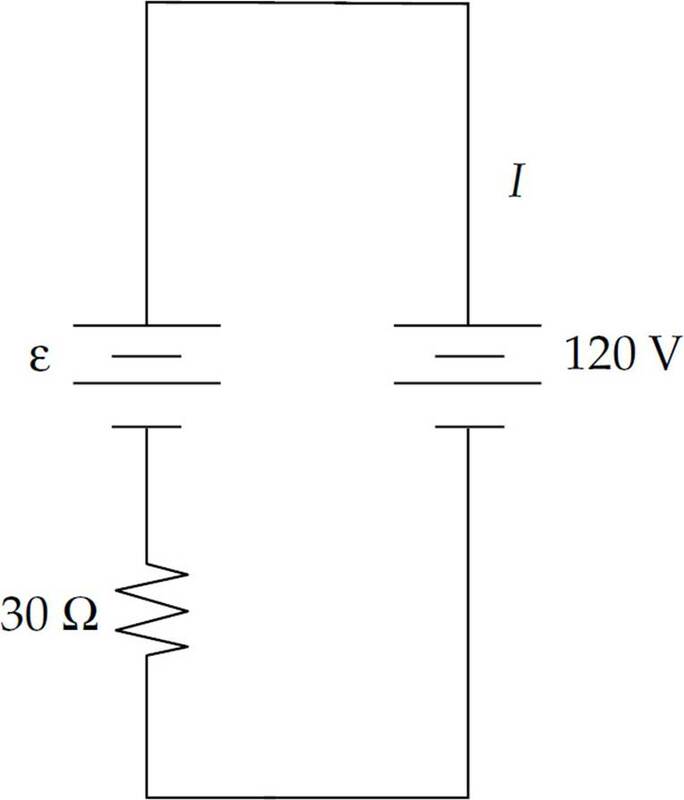 (a) Determine the current through the 20 Ω resistor immediately after the switch is moved to position A. (b) Sketch a graph of voltage vs. time for the voltage across the 10 Ω resistor. After a long time the switch is moved to position B. (c) Determine the current through the 15 Ω resistor immediately after the switch is moved to position B. (d) Determine the amount of charge stored on the upper plate of the 20 µF capacitor after a long time. 3. A uniform magnetic field B is directed into the page, and exists in a circular region of radius d. A single loop of wire of radius D is placed concentrically around the magnetic field region in the plane of the page. The initial magnetic field strength is Bo. Calculate the following in terms of given values and fundamental constants. (a) Determine the initial flux through the loop of wire. 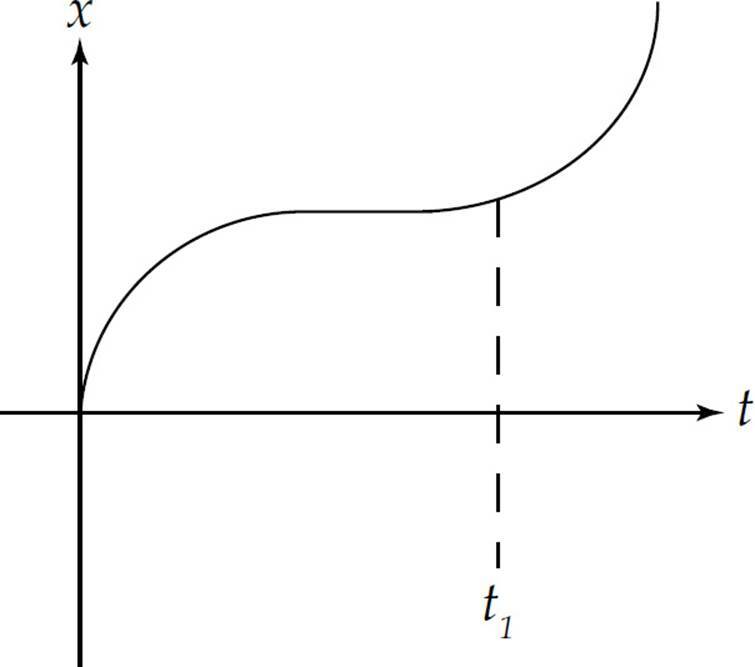 At time t = 0 s, the magnetic field strength as a function of time t is given by the equation B(t) = B0t2, where B0 is a positive constant. (b) Determine the magnitude of the induced emf in the single loop. (c) Determine the direction of the induced current in the loop. The loop of wire has a resistance R.
(d) Determine the energy dissipated in the loop up until a given time t1.